When interior designer Carly Waters first came across her latest project, she was struck by the coldness of the home’s architecture. Her clients—a young couple who just had their first child—brought on Waters to infuse the space with a laidback Cali-cool style and hints of modern sophistication. 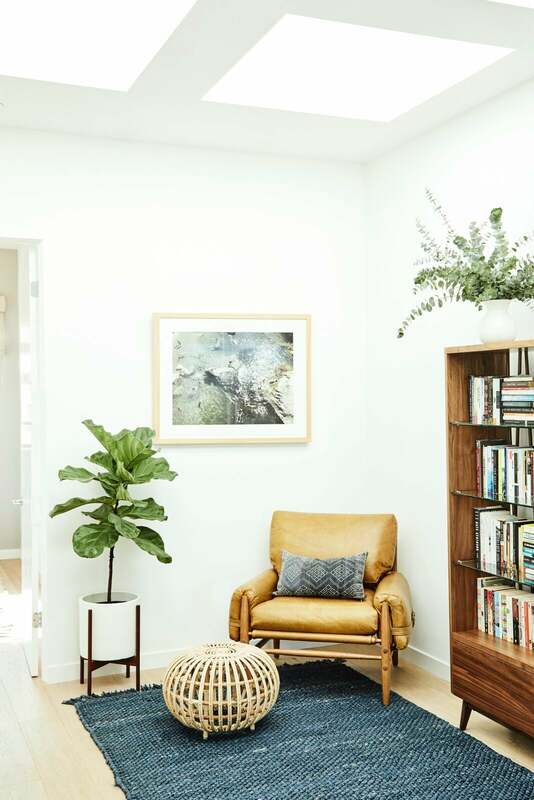 Situated in Mar Vista, California, the home bore a lackluster quality in serious need of color and texture to emulate a unique combination of the couple’s individual aesthetics. Waters set to work, establishing elements of interest and personality throughout. Custom high-end furniture was brought in to evoke that coveted one-of-a-kind note, softened by vintage pieces for a personal touch and character. The high-low mix of decorative accents and furnishings resulted in a dynamic interior riddled with style and sophistication. Even though the backdrop of the home comprised an almost exclusively all-white scheme, thoughtful layers of patterned textiles and woven materials brought on a bold dose of personality to the space. The home’s open-layout meant that a sense of cohesiveness was a crucial factor of the intended design scheme. The various zones that were integrated within the open space—namely, the kitchen, dining room, and living room—each required an element of individuality, and yet it was equally as important that they remain connected to one another. The sleek and streamlined qualities of the kitchen were met with the warmth of the mango wood furnishings found by way of the counter stools and the dining room set. Intricately detailed pendant lighting, vibrantly colorful wall art, and dramatic greenery instantly elevated the otherwise pared-down properties of the two zones. The living room, found directly adjacent to the kitchen and dining area, bore similar tonal properties, epitomizing the intersection of the home’s stylistic direction. An oversize Persian rug brought forth a burst of saturated color, instantly offsetting the subdued properties of the surrounding elements. The console, strategically positioned behind the sofa, inspired a hint of mid-century modern flair, all the while visually separating the living room from the other two areas. Throughout the home, you’ll notice touches of minimalism met with detailed odes to the past—a design characteristic Waters was keen on maintaining within each and every room. One of the bedrooms was a key illustration of such, where a wrought-iron bed was paired with the undeniable focal point of the space: a vintage television set. Hints of sage green and blush pink gave the bedding a much-needed chromatic lift, playing to the mellow yet detailed scheme of the space. “The retro TV is the only furniture item the clients brought into the house that they wanted to reuse,” notes Waters of the vintage piece the couple found on the street while living in San Francisco. Spoiler alert: It doesn’t work, but it sure does make for a great statement piece. In the hall, a well-curated nook was designed to double as a reading area packed with color that felt subdued yet impactful. The warmth of the mid-century bookcase merged well with the yellowish hue of the leather seat, paired with a soft blue area rug to further accentuate its allure. The master bedroom took on a relatively more contemporary finish—outfitted with a steel frame canopy bed and layered textiles throughout, the neutral scheme was intended to spark a sense of calm and serenity within the space. That said, the statement-worthy feature of the room would have to be the marble fireplace, located around the corner from the similarly toned bathroom, which came flooded with natural light and a vividly defined hint of sophistication. Decorative elements consistently sprinkled throughout the home, earmarking the entirety of it as a serene reprieve with a touch of modern elegance.